At the end of its monthly meeting, yesterday, the Federation Accounts Allocation Committee, FAAC, shared N619.857 billion to the three tiers of government as revenue generated for the month of February 2019, but shared in March 2019. 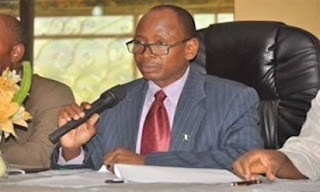 Acting Accountant General of the Federation, AGF, Mohammed Usman, who briefed newsmen at the end of the FAAC meeting in Abuja, said the amount was lesser that N505.246 billion shared in January, which he attributed to the persistent shut down of oil installations within the month under review. The AGF also disclosed that the balance in the Excess Crude Account, ECA, currently stands at $183m, which is less than $249 billion recorded in the previous month by $66 million. A communiqué at the end of the meeting indicates that from the N619.857 billion, the Federal Government received N2223.157billion, the states received N113.188bn, Local Government Councils received N187.263 billion. The oil-producing states received N45bn as 13 per cent derivation revenue and the Revenue Generating Agencies received N9.725 billion as the cost of revenue collection. Meanwhile, for February 2019, the gross revenue of N478.434 bn was received in the month of February 2019. This is lower than the N505.246 bn received in the previous month by N26.812bn. The gross revenue from Value Added Tax, VAT, was N96.389bn as against N104.468bn distributed in the previous month, resulting in a decrease of N8.079 billion.